Kids are awaited to celebrate their birthday between their friends.Birthday banner indicates which year your kid is going to enter.It is colorful and attractive when people look, it brings grand look. 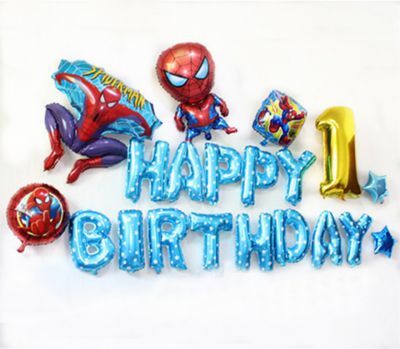 Spiderman balloon also drag the heart of your kid when they look it in a birthday banner. Blue color definitely steals the heart of every one who comes to the party. These all arrangements make them feel that they are in an imaginary world.Spider - Birthday Balloon Celebrations Combo consists of 20 balloons. Spider - Birthday Balloon Celebrations Combo Available Only in Vijayawada. Sameday delivery is possible. Ships in 2 to 3 business days if your delivery location is other than vijayawada city.